Men can have the moon. Aerospace engineer and immigrant Diana Trujillo is taking us to Mars. Men can have the moon. 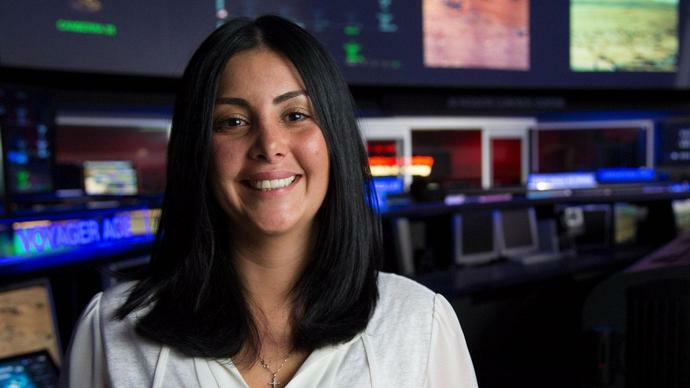 As an engineer at NASA's Jet Propulsion Laboratory, Diana Trujillo is taking us to Mars. Trujillo's work on the NASA Mars Curiosity Rover mission has given us our first close-up glimpses of Mars and clear evidence that the Red Planet was once capable of supporting life. She didn't let borders or biases stop her from pursuing her passion for space exploration. She landed in America with no immigration papers and no English, yet within just a few short years, she was completing an engineering degree and attending NASA Academy, where she eventually landed her dream job. Trujillo was born in Cali, Colombia, where a love of space gave her hope on earth. "We'd boil an egg and cut it in half and that was our lunch that day. I remember just laying down on the grass and looking up at the sky and thinking there has to be something out there better than this." At 17, she left for America to find out. During her junior year of college, Trujillo won a spot at NASA Academy. It was a victory that came with culture shock. "I was the first immigrant, Hispanic woman in the program. I was coming in scared, unsure with no confidence whatsoever. I got to meet astronauts, CEOs of companies. None of them looked like me." That didn't stop her from being one of only two in her class to be hired by NASA in 2008. Trujillo worked as a telecom engineer on the 2012 Mars Curiosity Rover program. Translation: It was her job to make sure Curiosity could communicate with Earth. When the first images came through, "I could not believe we had done it," Trujillo recalls. "I am one of the first 30 people in the world to see Mars." Today, she's overseeing a rover tool used in collecting surface samples on the Red Planet. Trujillo's journey from Colombia to Curiosity is the kind of story America was built on. "I am the person that came from another country trying to figure out a better life in a different place and then took that little seed and expanded it to taking the entire human species into the next level of exploration."